Sunday, we held a gran bazar at Vida Abundante Church between 3:30 and 5:30 pm. We knew our schedule would be tight as church service takes place at 6:30 but it seemed like the right day to do this. On the previous days during our distribution of school supplies, we gave each child a coupon redeemable for 25 pesos in clothing at the bazar. 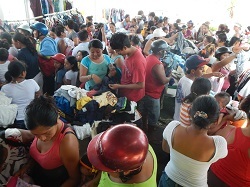 Many of the used pieces of clothing are priced anywhere from 5 to 20 pesos so a family with 4-5 children would have 100-125 pesos to spend and they would be able to get a number of clothing items. 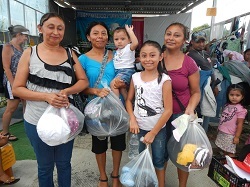 The priority with this bazar was to get clothes distributed to the families that had received school supplies. It appeared that we were successful as many vouchers were turned in. Our bazars have become very popular and we did have a large number of paying people as well and to our surprise, we took in more money than we ever expected. Some of this money will be used to purchase school supplies for next year while some will go toward future projects that might benefit additional local families. We now have people busy in the United States, purchasing school supplies that are on sale at local stores during their “back to school” sales. 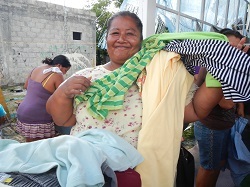 If you can help us, please contact us with your email address by writing to Karen@friendsofcozumel.com. We’ll be happy to share what our greatest needs are and what we believe is currently on sale. This entry was posted in Uncategorized on July 22, 2013 by pedersenll. Mike and I were happy to be involved in the bazaar set up and packing back to the bodega…Many articles of clothing were sold and many happy families left with all the smiles that we saw. Thanks to Karen and Larry Pedersen and the other volunteers that made this all possible for the needy families in Cozumel. It was a great day! !